Our Legends Vertical Blinds offer an affordable solution for covering and insulating large windows in your home, office or apartment. Vertical Vinyl blinds are a popular window treatment for large sliding glass doors as well. 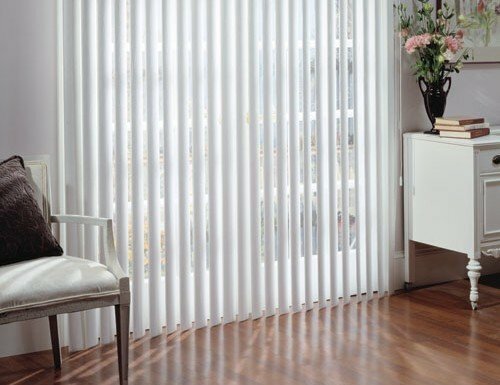 Vertical blinds are durable and easy to use. These particular PVC window blinds come with a 22 gauge slat for controlling light and providing privacy. Operation of this blind is simple. Drawing the blind open offers you an unobstructed view through the window. When closed, this vertical blind offers total privacy. These smooth vertical vinyl blinds will not chip, warp, or crack and will retain it’s shape for a lifetime. Available in a wide variety of colors, you will be able to find the perfect match for your home. You always have the option of ordering free samples to make sure you choose the right color. 22 gauge builder quality PVC vanes. Do these open in the center or from only one side? On the website they are only available to open to one side or the other. We can make them open to both sides or a split draw but you will need to call in to place that order. If I wanted to mount these on the inside, what should the depth be? The approximate minimum mounting depth for a vertical would be 1”, and the approximate flush mount depth would be 3 ½”. What exactly is PVC? I am looking for fabric such as linen. PVC is a solid vinyl. We do have other materials like faux wood and fabric. This link will take you to our fabric vertical blinds. We can send you free samples if you like. This was an amazing experience from ordering samples to receiving the blinds in the mail, to my husband installing them. This was an amazing experience from ordering samples to receiving the blinds in the mail, to my husband installing them. Quick, easy, and professional. Very happy,I should of ordered them a half inch longer,but I didn't have my window surrounds finished.Easy to install,just got the second one installed,had a broken window I wanted to replace first. Very happy,I should of ordered them a half inch longer,but I didn't have my window surrounds finished.Easy to install,just got the second one installed,had a broken window I wanted to replace first. Thanks again for a quaility product. I like the blinds i bought from u.
I like the blinds i bought from u. But, I must be honest and say the instructions were rather difficult for my simple brain. But, they look good once i put them up! Thank u! Hope to buy future blinds from u! I have only inspected them in the box and not installed them yet. I have only inspected them in the box and not installed them yet. So, my ease of installation rating reflects this. The head rails alone look very appealing. And I can't wait to use the chains to rotate the slats and the cords to collapse & expand them. I followed their instructions on how to measure and ordered it on their website, I have extremely wide of size windows, they custom made the blinds . I followed their instructions on how to measure and ordered it on their website, I have extremely wide of size windows, they custom made the blinds . They arrived within three weeks. They fit perfectly , the color was perfect and the installation was easy.